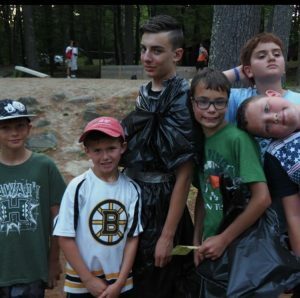 Zach at a plastic bag fashion show activity with his campers. Because of Camp I… understand what it’s like to be a role model. In my first year at Quinebarge, I was already an older camper. Being thirteen, I understood what it was like to look up to older kids. In the same way that I had looked up to older kids when I was younger, I knew that younger campers would be looking up to me. Most recently, I was a CIT and worked directly with campers. I got super close with my campers and loved being someone who was always there for them. Originally, I had anticipated my kids taking on some of my behaviors, but was truly surprised to see the extent to which they adopted my mannerisms and word use. In the blink of an eye, the entire Pawnee cabin was double knotting their shoes and saying “sick” to talk about things that were cool to them. That summer, I not just learned what it was like to be looked up to by a camper, but also what it’s like to impact a child. This year, I’ll return as a Counselor and be responsible for another cabin of campers. I’m excited to get to know another group of campers, and to be there for them as they discover more about themselves throughout the summer, the same way that I did only a few years ago.